Manufacturer & Exporters of ASTM A335 Alloy P5/5B/5C Seamless Pipe & A213 T5/5B/5C Welded Tubes, Alloy Steel P5 ERW Pipes, Alloy T5 EFW Tubes Supplier in India. We Neon Alloys, is a largest manufacturer & exporters of Alloy Steel ASTM A335 P5/5b/5c/ Pipes & ASTM A213 T5/5b/5C Tubes. This Pipes & Tubes are used in Boilers. We have a huge stock of Pipes & Tubes in various Grades & Size. Alloy Steel ASTM A335 P5/5b/5c/ Pipes & ASTM A213 T5/5b/5C Tubes is used for various applications in different industries such as Thermal & Nuclear Power Plant & Energy Industry, Oil & Gas & LNG, EPC, Chemical Industries, Fertilizer Plants & Water Treatment, etc. We check our products on different parameters before their final dispatch in order to make sure that these are in compliance with the global quality norms. The Alloy Steel pipe & tubes shall be suitable for bending, flanging, and similar forming operations, and for fusion welding. The steel material shall conform to chemical composition, tensile property, and hardness requirements. 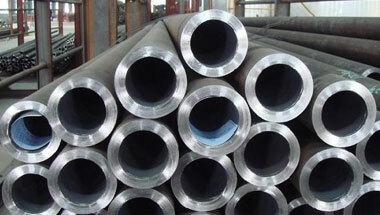 Each length of Alloy Steel pipe & tubes shall be subjected to the hydrostatic test. Also, each pipe shall be examined by a non-destructive examination method in accordance to the required practices. ASTM A335 P5 High Pressure Pipe & Tube Exporter, Alloy Steel A213 T5 Seamless Tubes Supplier, Alloy P5 Fabricated Pipe, ASME SA335 P5 SAW/LSAW Pipe Manufacturer in India. UAE, Bahrain, UK, Australia, Colombia, Ethiopa, Ghana, Azerbaijan, Chine, Kazakhstan, Vietnam, Africa, Dubai, South Africa, Brazil, New Zealand, Iraq, Canada, Tunisia, Iran, Germany, Israel, Sri Lanka, Turkey, Uganda, Saudi Arabia, Houston, London, Nigeria, Italy, Argentina, Sudan, United States, Malaysia, Egypt, Jordan, Thailand (Bangkok), Angola, Cameroon, Morocco, Trinidad and Tobago, Democratic Republic of the Congo, Venezuela, Algeria, Kuwait, Peru, Mexico, Mozambique, Russia, Indonesia. Manama, Kano, Subra al-Haymah, Tel Aviv, Harare, Singapore, Kaduna, Hong Kong, Luanda, Omdurman, Muscat, Kinshasa, Fez, Giza, Jeddah, Cairo, Aqaba, Bulawayo, Freetown, Lagos, Doha, Colombo, Ibadan, Beirut, Lusaka, Riyadh, Bethlehem, Douala, Abidjan, Dammam, Maputo, Accra, Soweto, Maiduguri, Lubumbashi, Cairo, Johannesburg, Tehran, Yaoundé, Data from the UN, Abu Dhabi, Antananarivo, Tripoli, Port Elizabeth, Rabat, Dar es Salaam, Conakry, Jerusalem, Addis Ababa, Dakar, Istanbul, Kolwezi, Dubai, Pretoria, Brazzaville, Sharm el-Sheikh, Byblos, Nairobi, Durban, Mogadishu, Zaria, Ouagadougou, Bamako, Mecca, Khartoum, Amman, Alexandria, Mbuji-Mayi, Benin, Algiers, Port Harcourt, Kampala, Casablanca, Cape Town, New York.